// Between the lines //: Valentine :: wrapping up - ctd.!! Valentine :: wrapping up - ctd.!! Want to know how I did it? Keep on reading, then! Here's what you'll need for this last minute project. - 3 strips of fabric or ribbon, about 1 yard long (that's a rough guess) and 5mm wide. I've used two strips of left over fabric, each with a different print, and a piece of silk (embroidery) ribbon. When cutting the strips, don't worry too much about cutting it straight or getting a ruler, just cut! You won't see the imperfections once braided. - a chopstick and something to hold the chopstick into place while braiding (I've used a cutting board with handle; you could also use a ring binder,...) - this is just for practical reasons, i.e. to keep the braid from twisting and slipping away while you go, and it will help you to make a nice and evenly spaced out braid. - a template - this could be anything. I've used a flower. A heart would be nice too. It's Valentine's Day after all! further decorations (optional): beads, colorful buttons, etc. 1. 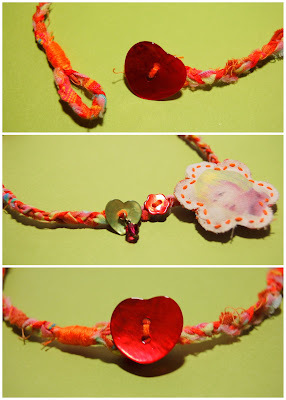 Make a braid, using the three strips of fabric. I'm convinced this doesn't need any further explanation... Tie a knot at both ends when done, to secure. 2. Prepare the picture. For this step, I refer to this post. I've used the exact same procedure. 3. Cut out your template from both pieces of fabric. Did I say one had to be of a light color if you want to transfer a picture on it? 5. Squeezing a small amount of batting or fiberfill in between, with a contrasting color, sew the two pieces together using small stitches. 6. Cut the braid to the desired length, taking into account an extra margin for making a loop at one end later. 7. Sew the ornament into place onto the braid. Do the same for the other decorations you chose.